Here is footage taken of the ocean at Old Silver Beach in North Falmouth, Massachusetts just after the ‘Bomb Cyclone’ battered the northeastern United States. The ocean and the waves look to be completely frozen in this video. Right now, we all on the east coast are dealing with the coldest weather of 2018, with temperatures in the negative degrees with 25 – 50 mph freezing winds. Have you ever wondered what in might look like under the sea ice in Antartica. Well here is footage captured by and under water drone at O’Brien Bay, near Casey research station. Kind of reminds me of a scene from Avatar. Brian Recker and his crew from One Harbor Church caught this footage of a shark feeding frenzy taking place just off shore at Cape Lookout in the Outer Banks of North Carolina. 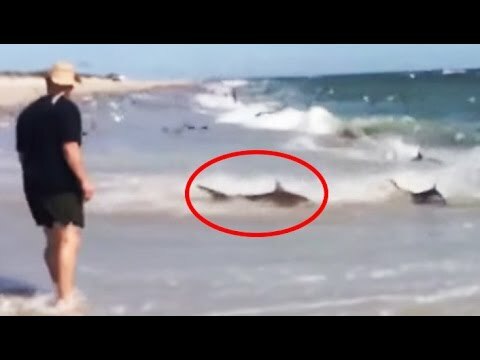 Watch as sharks, sea gulls, pelicans and other animals have a feeding frenzy trying to eat a large school of blue fish. This is one day I would have to pass on swimming in the ocean. Checkout this Amazing Footage! Have you ever seen a polite and social stingray before? A lot of people are scared of stingrays because of their dangerous spike tail. The most famous death by stingray was when a stingray’s tail killed ‘Crocodile Hunter’ Steve Irwin back on September 4, 2006. 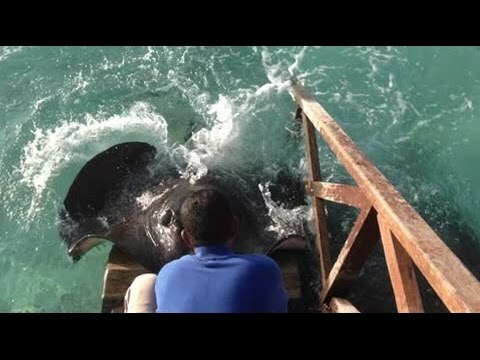 Well, this footage here shows just how nice and social stingrays can really be. Tourists that were on vacation in the Maldives, a group of islands in the Indian Ocean, just south of India captured this footage. They were feeding fish just off the dock when the extraordinary event unfolded. It was published to Youtube on the 19th of September 2014. Here is some amazing footage of a massive sized school of jellyfish off the coast of Denmark near Langeland island. The footage was captured on GoPro cameras showing amazing underwater footage of the moon jellyfish. Kenneth Pagh’s Youtube channel uploaded the video on the 29th of July. 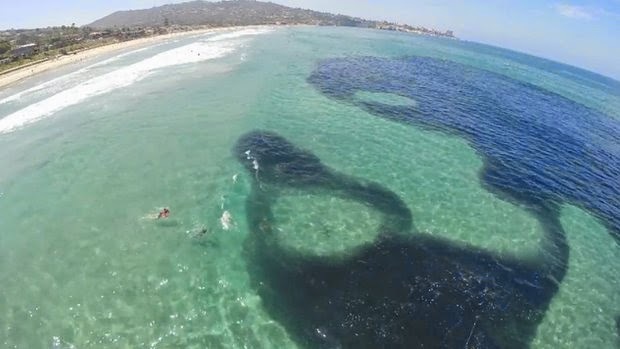 A large school of Anchovies were spotted just right off the coast of La Jolla, California July 8, 2014 by local college students and staff. The video shows footage from the pier taken by the staff, and also contains footage taken under water by students. 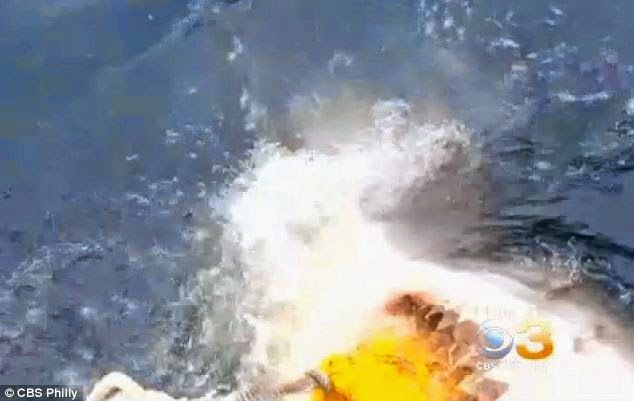 Watch as a large great white shark comes a little to close for comfort, eating a chum bag off a raft. Fisherman Steve Clark caught this awesome footage, off the coast of Cape May, New Jersey. Rocky Mountain Flyboard, home of the hottest new extreme watersport to hit the Wasatch Front. Whether you want to rocket 45 feet out of the water, swim like a dolphin, or soak the top deck of your group’s houseboat at Lake Powell, riding a Flyboard is an experience like none other. Russian firefighters clown around an design a homemade style water jet flyboard, that seems to work perfectly. A surfing water jet board seems cooler to me than the convention water jet pack.